I'd read somewhere that the efffects of smoking and drinking while pregnant in the first month or two are far less significant than in the last trimester. Obviously, that doesn't justify it if you knowingly do so. Which brings me to your next question. I think given the efficiency of most birth control methods and the aforementioned information both dramatically lower the potential impact -- to a level where I think most of us are comfortable with women drinking or smoking provided they're responsible enough to be attuned to their own bodies. I will say that there are few things that get me more upset than seeing a pregnant woman in a bar, which I've oddly seen way too often. 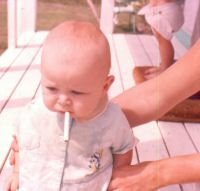 Could there even be an argument for drinking or smoking during pregnancy being considered child abuse? Jeff's right that the effects in the first trimester are much different than in the later trimesters. In the early stages, the smoking and drinking don't really affect the kid like it would later on. Since those commenting so far are men, it seems a bit unfair to say that women must stop drinking and smoking while sexually active. Plus, that's just about impossible. If that became common, our bars would be empty and I'd have no one to hit on. I am a man. But, I could impregnate a woman with our child, and have to blindly trust her to take care of her body (and her child's) throughout the course of the pregnancy. And the fact that I get no say in how that child is treated is hard to deal with. You have a say in how it's treated, you can be there and encourage her to do the right thing for the kid, but you can't go declaring that all women that are sexually active cannot drink or smoke. You have a say. You can advise your pregnant partner and encourage her to do what's best for the baby. And unless you've left her, you're not really trusting her blindly. You can be there and help her, etc. I did declare it. I'm not talking about legislation. I'm wondering if it simply makes sense. it makes sense but that is about it. We should just make all woman sterile amd do test tube babies.